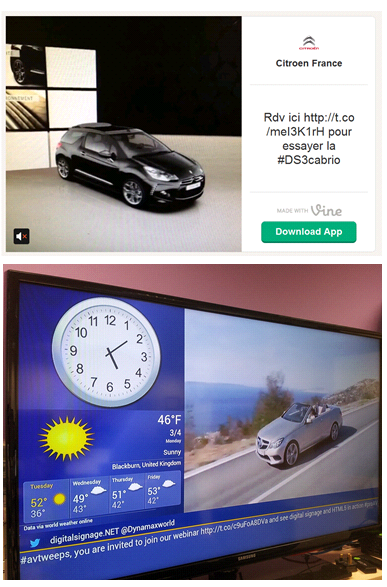 You're Here: Home / Blog / Digital Signage / Digital signage and Vine- where’s the common ground? 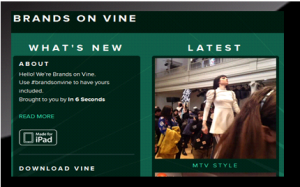 Digital signage and Vine- where’s the common ground? Any social media aficionado would be well- acquainted to ‘’Vine’’ by now- a mobile app introduced by Twitter that allows users to film and share 6-second videos. As they put it, this is just another way of sharing life in motion and small and large organisations alike have been more than eager to do so. While some may complain that 60 seconds are not enough to portray an idea, the examples we’ve seen so far seem to prove the opposite. But the cool thing about Vine as an app is not the length of its videos, but its ease of use. In fact, simplicity was the fundamental idea behind its design. ‘’An interface should get out of the way’’ says Vine’s creative director, Rus Yusupov, explaining the absence of the Play and Pause buttons, of the timeline scrubber or of the blinking red light that usually appear in all video apps. People should focus on the experience and not on the technology, he says. The same goal should be embraced by digital signage providers. If ease of use drives adoption, then everything from installation to actually scheduling content in digital signage software should be as straightforward as possible. The whole process should be geared towards making it as easy as possible for people to send their message to wherever they need to, whenever they want to- (which is why they chose using digital signs in the first place) and not towards making them experts in a certain piece of technology. At Dynamax, our goal regarding digitalsignage.NET is to make the experience of using the software increasingly similar to a normal web experience (i.e. attaching files to an email or on a social media channel) so that users won’t really need a User Guide unless they wanted one. We could say that Vine’s brevity offers a great potential for creativity. Brevity favours digital signage as well, which isn’t the right medium for long videos, lengthy blocks of text or myriads of images filling the screen at the same time. Be selective and brief is the advice we insisted on in various articles and white papers. Post the most relevant and topical messages and keep them short and snappy. But be imaginative. Digital signage is a highly visual medium that allows one to devise new, fresh ways of promoting products, presenting a company or sharing news. Giving people a look behind the scenes (which is what our client Blue Cross has done, in a recent Vine post), sharing a great customer testimonial, or expressing a brand’s beliefs can be done in various ways, totally different than in print. Oreo’s ‘win’ of the Super Bowl with the photo of a biscuit and a line of text shows that creativity doesn’t reside in the complexity of the technology used. Impactful communications are often very simple. 3) ‘’Social is emerging as the starting distribution point of content’’ (said Brian Norgard at Chill.com, quoted by Mel Exon in an article for Marketing Week). Vine allows its users to create and share content concurrently, using the same platform. Digital signage applications such as digitalsignage.NET, allow users to promote their social media channels and the content posted on them (to see how we do it, sign up for our webinar here). Having a social media presence is important but acquiring fans and followers is crucial. Displaying those channels on the screens could mean more than letting people know you’re on Facebook or Twitter. It could mean redirecting them to your social media accounts on the spot through the use of QR codes or NFC technology. Evolution drives simplicity of use which in its turn, drives adoption. The first computers had the size of a large room and consumed as much power as a few hundred modern PC’s. The first digital signage solutions consisted of screens, media players, cables connecting the devices and content management servers. In the future, more and more systems will see media players and screens forming one single device and interoperability between the systems will be the new standard. There is something compelling about the simplicity of Vine. There is something compelling about simple digital signage solutions too. In the end, it’s not all about the technology but about the user experience and the end result. Sign up for our webinar and let us prove the simplicity of digitalsignage.NET. This entry was posted in Digital Signage, Marketing and Advertising by Dynamax. Bookmark the permalink.